Palmer turned to etching in 1850 in a deliberate effort to revive the visionary intensity of his youth when he was a disciple of William Blake. His prints evoke an idyllic earthly paradise. 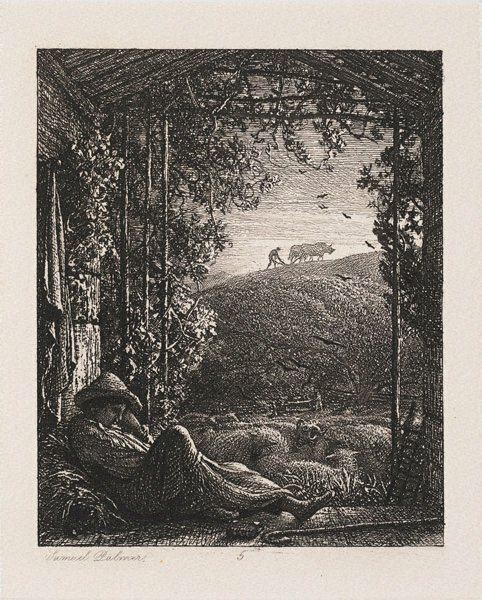 In the foreground a shepherd sleeps under an Italianate pergola. There is a flock of sheep and in the distance a ploughman and his oxen work the hillside. Peter Raissis, Look , 'Diverse, individual and imaginative', pg.24-27, Sydney, Jul 2009, 26, 27 (illus. ).